Not this this is breaking news as it did happen a short while ago but it will be great to start seeing these packages filter into the shelves at your local. Jura has revamped it packaging (again). If you recall the original packaging from a few years back was grey and somewhat drab. 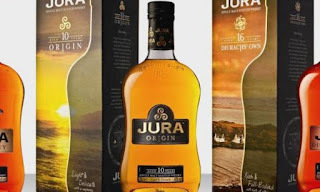 A couple of years ago, as we saw the profile grow and more signature expressions hit the shelves in common Jura went through branding overhaul from packages to website, and it looked great. Now is by far the biggest step to date with some real WOW being added to the family as a whole. Thankfully we have seen the unique shapely bootylisious bottle remain. Love those curves. According to widespread reports (though it seems no one is actually referencing quotes they claim to have), the packaging for each bottle tells a particular story of the island (have not seen a package up close), features its own colour pallet (clearly visible), and when lined up in order a panoramic island profile is revealed (also clearly visible). Setting aside the top three sales pitch points replicated by everyone, I'll put my neck out and actually just say who cares because it looks great well done Jura! At this time, this revamp is yet to be revealed on the Jura website and I personally found out about this news via the Jura Facebook page. All too often we see swings in the market where bottles, labels and packages are changed for no other reason that for the sake of change. Jack Daniels vs Wild Turkey as a resent note. Thankfully in this case, even though I loved the sophistication of Jura's previous lineup, the colour variations and intricate details add that additional depth of field so well deserved of such a good whisky. Metrosexual? maybe. Feminine? Certainly but with such a flavour profile like silk and shaped like Marilyn Monroe Jura is certainly a girl. Baby got back and no doubt about that. Slainte Jura for staying true to your product and here's to your continued success in an ever congested market.